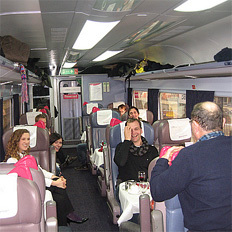 Trainhire.co.uk specialises in train travel for very large groups over 100 passengers. We can transport up to 700 per train and over 3000 per day. By booking direct with us, you have a single contact for your entire booking, avoiding complicated planning and multiple bookings with different train operating companies. By privately booking very large groups on trains we can often obtain discounts and savings which we pass on to you. You'll have a single named contact for your private train rental who you can contact directly with any questions. We can help you with bookings in the UK and also across the European rail network. To start planning your journey with us, please contact us with details of your train journey.